Home / Blog / Sisters, Act! We all want active, diverse tenant participation in the social housing sector, and there are some incredible teams, schemes, and of course tenants across Wales leading the way. However, at Tai Pawb we wanted to know what really made these volunteers and community leaders tick. We noticed that female engagement is generally very good, but the range of women getting involved is not always as diverse as it could be. Of course this doesn’t mean we’re unconcerned with levels of male engagement (which has its own set of issues and solutions) but for this project we decided to explore the diversity of female engagement and so Sisters, Act! was created. This wasn’t done alone, and we worked with the Co-production Network for Wales and a number of Gwent based housing associations; United Welsh, Pobl, Bron Afon, Melin Homes, Newport City Homes, Monmouthshire Housing Association and Llamau to take this idea forward. All of these were organisations with active tenant participation, and bringing them together was a great opportunity to discuss ideas and plan our next steps, aiming to work as co-productively as possible. Our aim was to work with active women tenants to try and pin down what had made them get involved with their landlord, to offer their time and energy. 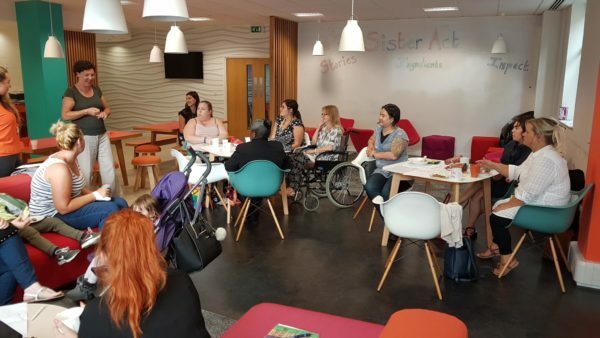 On the day, a group of around 15 women gathered to talk and share their experiences in a really informal and friendly atmosphere. In only two hours, we heard some amazing stories, great passion and a genuine desire to help improve their communities. By gathering women together to talk about why they engage, what the barriers are and what helps, we can now share this with housing associations across Wales to contribute to making tenant participation as representative as the diverse communities they live in. Tai Pawb is planning to continue this work in 2019, potentially working with another ‘need to reach’ group, so if you are interested in finding out more about Sisters, Act! or contributing to our 2019 project, please contact Ceri Meloy, Head of Business – ceri@taipawb.org.